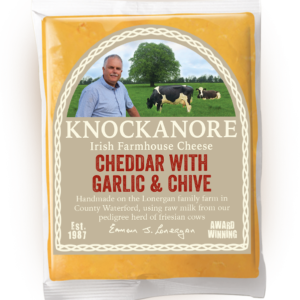 Knockanore Cheddar with Garlic & Herbs is made using raw milk on our farm in Ballyneety, Co. Waterford. All of the milk used comes from our pedigree herd of Friesian cows that graze on the lush rolling hills of the countryside. Our cheese is made using traditional cheddaring techniques which involve stacking the cheese curds on top of one another to produce a firm but slightly open textured cheese. We add the herbs into the cheese vat before the cheese is actually made – this imparts a better flavour to the cheese. The garlic is left until the end, after all the whey is drained away, to ensure a more subtle garlic flavour. By way of contrast, many of our more commercial counterparts take a pre-made bulk bought cheddar and then mash in flavourings and re-mould the cheeses in to rounds! Our cheeses with herbs and garlic are aged for a little less time than our vintage and smoked cheeses, and as such they have a lovely subtle sweet taste that works in harmony with the other flavours. Also, while still technically a hard cheese, it is less firm in texture. 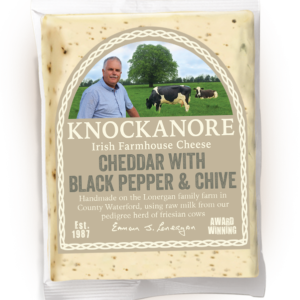 The cheese itself is mild with subtle, sweet and creamy tones, with notes of black pepper and chives. Cheddar cheese (milk), annatto, garlic, herbs. All our cheeses are proudly made with raw (unpasteurised) milk. In the cheese making process, there are also two essential adittions or ‘processing aids’, the use of a starter culture which is comprised of beneficial bacteria that help to raise the ph of the milk and the use of rennet which coagulates the milk so that it can then be split in to curds and whey (solids and liquids). Enjoy it on its own in a big chunk with some bread or crackers. 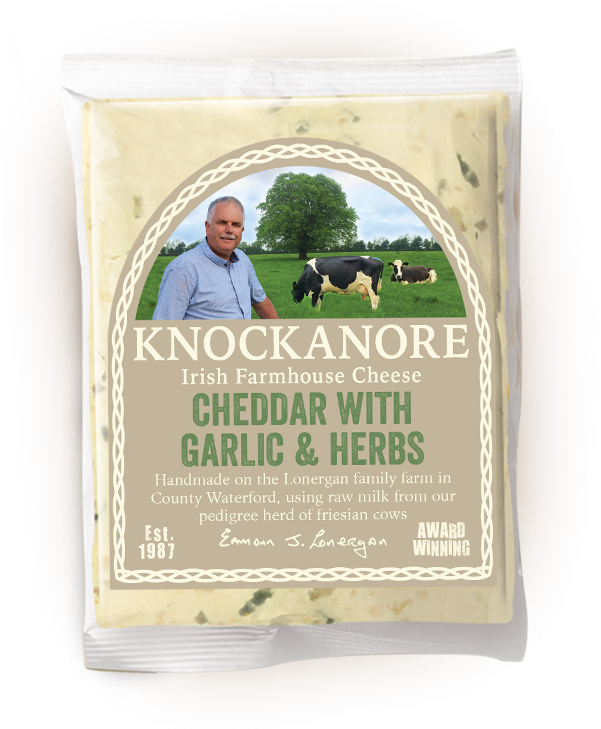 It works well when paired with a soft style of chutney and is very tasty on toasties or in a cheese sauce. We always recommend removing the cheese from the fridge a half hour or so before serving to allow the flavours to develop. 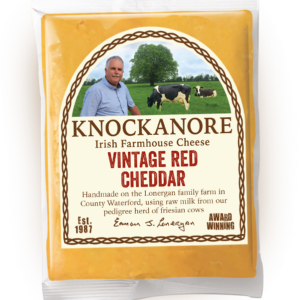 This cheddar works well with a chunky style of chardonnay and brilliant when paired with craft beer. As with all of our flavoured cheeses, we particularly recommend Dungarvan Brewing Company’s Mahon Falls Rye Pale Ale.